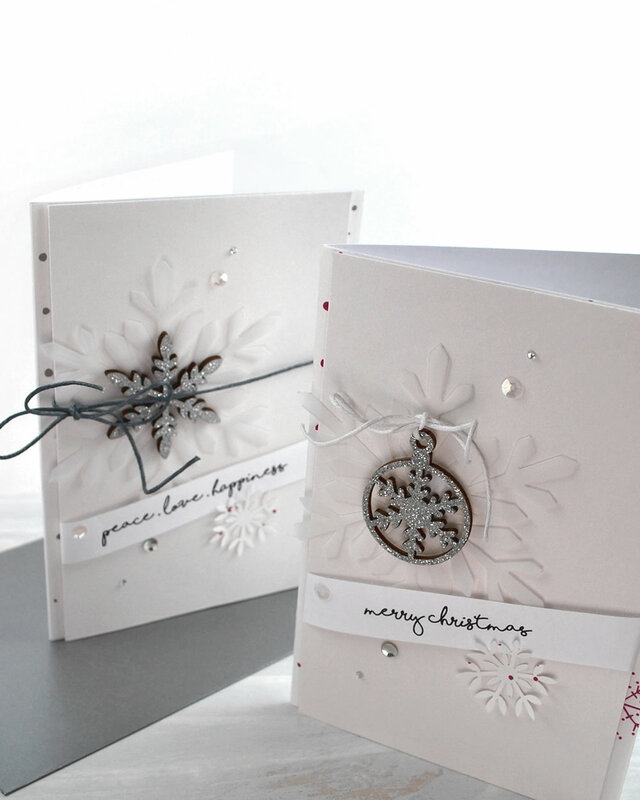 So continuing with my Step-by-Step to Christmas Crafting, I'm still on Step 3 and Making Cards. And this past weekend, I was able to make some more of my Christmas Cards : ) Actually, I was able to do more than that ... I designed some new Christmas Sentiments too. - a set of 24 Christmas-themed sentiments in a handwritten-style typeface in a single-line banner style. - they are black or coloured text on a white background, ready for you to cut or punch out and add to your cards. And you can find them *here* in the Boutique. I cut the patterned backing paper to A6 size & glued it to cover the front of my A6 Card Bases. Then I created my card mats. I cut my mats to the same height, but 1cm narrower than my card bases. I then embellished them with a mix of paper and wooden snowflakes & wrapped my pretty new sentiment loosely around them, securing the sentiments at the back. And I added the twine, the sequins & crystals to finish. I fastened my completed mats to the card bases, centrally, using dimensionals. And my cards were finished! In addition to the 2 complete cards I've already made, I have the supplies ready to go for another 6 which I'll put together this week. If you want to take a look at the new Christmas Banner Sentiments, you can find them *here* in the Boutique. Patterned Paper: 'Snowberry' Designer Digital Paper Pack printed onto Paperworks #46 Sparkling White Paper. From Paperchase. 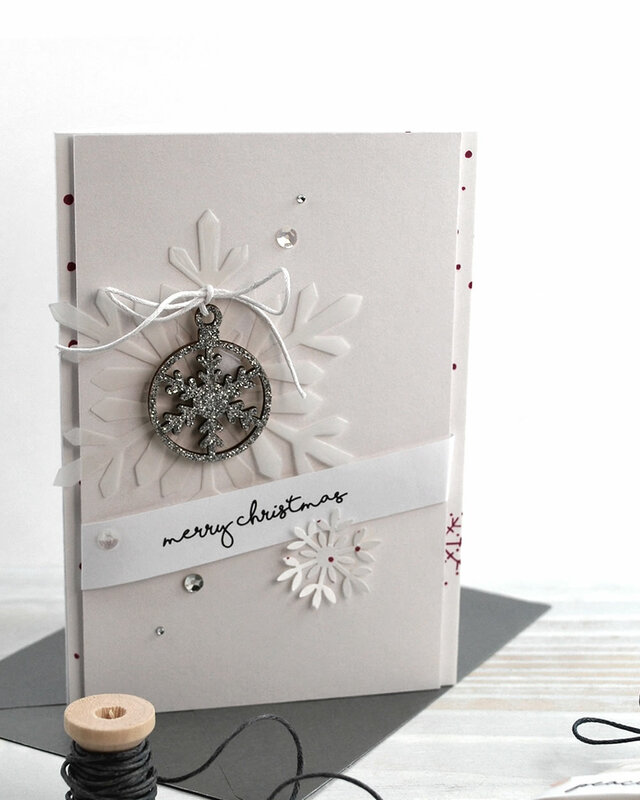 Cream Card Mat: 'Natural Calico' from 'Natural Neutrals' printed onto Smooth White Card.. Sentiments: 'Christmas Banner Sentiments' printed onto white copy paper. 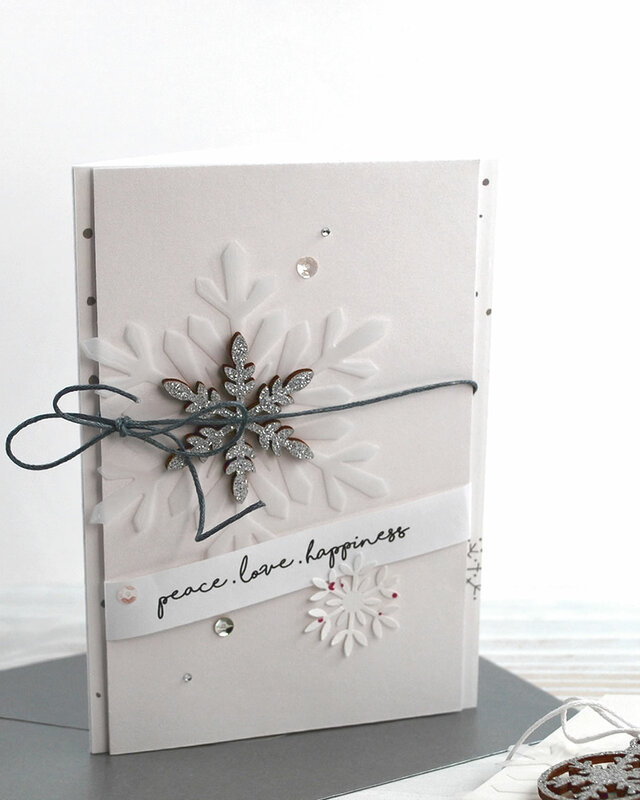 Large Snowflake: Hero Arts Fancy Snowflake Die. Cut from Parchment Paper. Small Snowflake: Martha Stewart Snowflake Punch. Wooden Snowflakes: from last years' Hobbycraft stash. 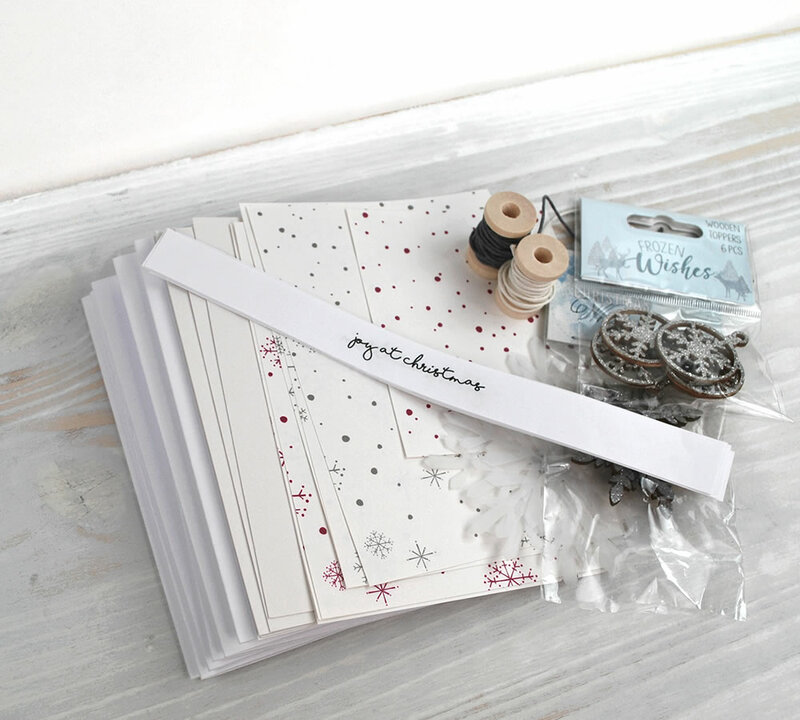 Scrap of 'Ditsy Dots' paper (also printed onto Paperworks #46 Sparkling White Paper from Paperchase), White & Grey Twine & a selection of small sequins & crystals. 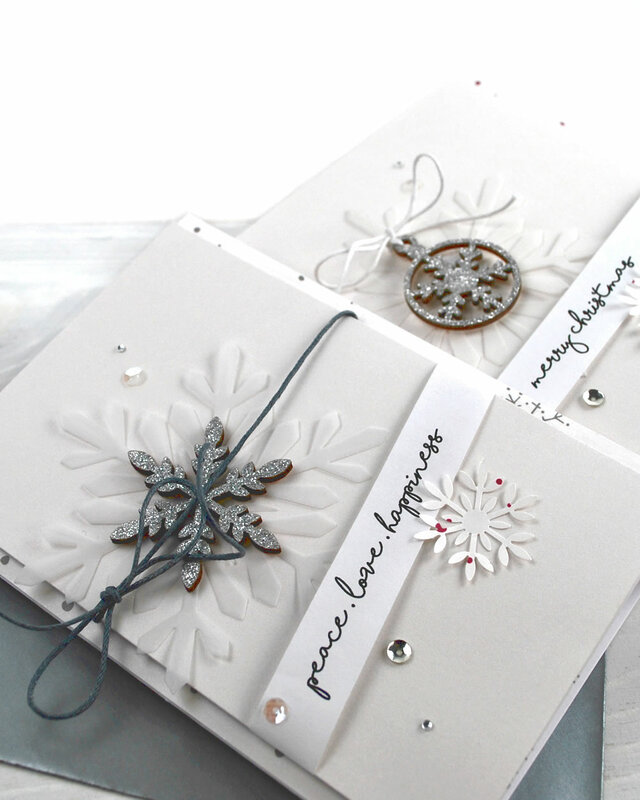 These are gorgeous cards Liz and I love the new sentiments. Think they will have to make their way into my basket along with the snowberry papers. So beautiful I may never buy a Christmas paper pad again.